How many teacher positions are vacant at your high school? Marlon Walker with the AJC is reporting 2,000 teacher vacancies in Metro Atlanta for the upcoming school year as of June 2016. On Tuesday, the board approved 3% raises for all teachers (The 3rd raise in 12 months) as well as a $500 retention bonus and up to a $3000 signing bonus for new teachers. 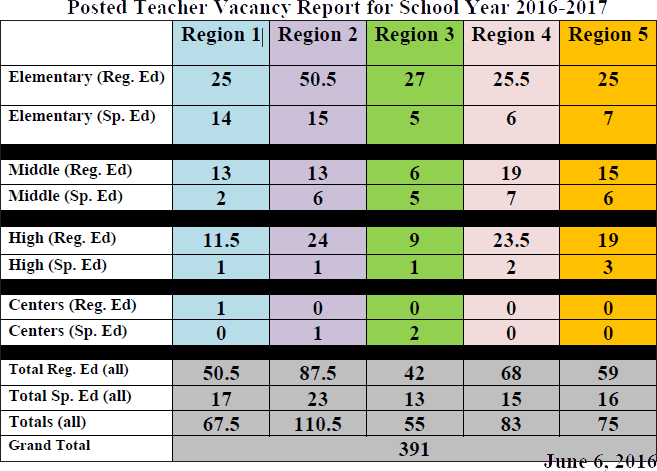 The latest DeKalb Teacher/Principal Vacancy Report from the county reports 12.5 high school teacher vacancies in Region 1. I asked Leo Brown, Chief Human Capital Officer, a couple of questions about the teacher vacancies in Region 1. Question: In the “Posted Teacher Vacancy Report”, is there a difference between the number of “Posted” vacancies and actual vacancies? Leo Brown: The posted teacher vacancy report reflects open teaching positions, for which principals are actively recruiting. Actual vacancies are budgeted positions that are not posted due to various reasons (low demand, potential low class size, etc.). Unposted teacher vacancies resulted in the “sweep”, where we were able to redirect financial resources back toward instruction. Question: Can we get a breakdown of the teacher vacancies by Job Title and High School for Dunwoody HS, Cross Keys HS and Chamblee HS (Region 1)? Here are the highlights for the budget and millage rate approved by the DeKalb County Board of Education last night. I was the lone dissenting vote for both the millage rate and the budget. My position is the millage rate should be reduced by significantly more than .35 mills and the budget should be realigned to focus more on the classroom and less on the bureaucracy. I support increasing teacher pay but I oppose the expansion of, and the raises given to, central office staff. A 3% raise will be given in the Fall to all full time employees (school house and central office). This will be the 3rd raise for teachers in 12 months. Existing teachers will receive a $500 retention bonus and new teachers will receive a signing bonus anywhere from $1,000 to $3,000 (retention bonuses paid in one of the October 2016 checks). The Millage Rate will be reduced from 23.73 mills to 23.38 mills (which is a .35 mill reduction). Despite the token reduction in the millage rate, your school district taxes will increase by approximately 8% this year. Your school property taxes have been increasing each year with the same silent method – as your property value rises the school district refuses to significantly lower the millage to compensate for this growth in value. In 2014, I wrote about how many residents saw a 13% school property tax increase. Keep in mind, growth in property taxes from the county and city governments are held in check by the assessment freeze. This freeze does not apply to school taxes. As your property value improves, generally, your county and city government taxes can only be assessed on your “frozen” property value. You do not get the benefit of a “frozen” assessment for the purposes of calculating your school taxes. DeKalb Schools is lowering the millage rate by only 1.5%. The .35 mill equates to roughly $7 million. DeKalb Schools continues to have the second highest millage rate in the state out of 180 school districts. On average, DCSD paid instructional subs less than the market midpoint for both short and long-term subs. (Market Midpoint: $94/day for short term and $113/day for long term substitutes.) DeKalb Schools FY2017 budget will pay short term subs $95/day and long term subs $115/day. DeKalb Schools currently staffs a nurse at every elementary school. The FY2017 budget will attempt to staff a school nurse at every school. The school district started FY2016 with roughly $93 million in the bank. It is estimated that in FY2016 the school district collected about $912 million but only spent $873 million and will end FY2016 later this year with roughly $130 million in the bank. Non certified employees had 2-3 furlough days depending on income level. There will be no more furlough days in FY2017. FY2017 will also include $44 million for a newly created Student Support and Intervention Division. That includes funding an additional $2 million over last year for the new nurses and another $6 million over last year for new student support and intervention services. The other $36 million will come from existing infrastructure. Superintendent Green believes that behavioral problems can result from issues in the home, issues in which entire families may need help. The school district intends to provide intensified wrap-around support. This support may include counseling, social work, psychological services, and community connections. As part of this effort the schools will implement Positive Behavioral Intervention and Supports during the 2016-17 school year. The $16 million increase in teacher allotments is based on student growth and the formula for staffing the school house has not changed. Renovating the old ISC (International Student Center) building will come out of SPLOST funds. $2.9 million from the General Fund will be spent on staffing and non discretionary items (books, desks, chairs, etc…). Pursuant to the Approved Cross Keys Redistricting Plan, overflow from Montclair ES, roughly 394 students, will go to school at the ISC building starting this Fall. Regional Superintendent – Mini Cabinet – $20.7 million will be spent supporting the Regional Superintendent Micro Cabinet. The idea is to give each regional superintendent and micro cabinet autonomy to run their region like an independent school district. Note: These documents do not reflect a .35 reduction in the millage rate, the raise in the substitute rates nor the additional nurses for all middle and high schools. June 22, 2016 – Here are the highlights for the budget and millage rate approved by the DeKalb County Board of Education last night. I was the lone dissenting vote for both the millage rate and the budget. May 13, 2016 – Total expenditures in all funds including the General fund, ESPLOST (capital outlay) and grants (special revenue), is $1.2 billion.